Carob is often billed as a healthy alternative to chocolate, due to the fact that it has a similar flavour to chocolate, but has less fat and no caffeine. However, this also means that carob is not as rich and intense as chocolate, so does not really offer a direct substitute. In Britain, too many of us have been programmed into viewing carob as a poor man’s chocolate, only suitable for vegan products and dog snacks. Yet in the Mediterranean, where carob trees grow, carob is a popular ingredient that is often used in cakes, such as the Portuguese ‘bolo de alfarroba’. This recipe makes a pleasingly simple cake, in which the flavour of carob takes centre stage. But you can fold in 100g chopped walnuts after you have added the egg whites if you want to add more flavour and texture. 02. How do I know when the cake is done? The key to this cake is not to overcook it. If you cook the cake for too long, it will dry out and become crumbly when sliced. For most cakes, the test for doneness involves lightly pressing the centre of the cake, which should feel firm and springy to the touch. This cake is more similar to a brownie, in that the centre should still feel a little squishy, but not wobbly. The cake will actually continue to cook and set when it firsts come out of the oven, due to the residual heat within the cake radiating outward. This is called carry over cooking, and you can see the same principle in action when you make scrambled eggs on the stove top. The key to perfect scrambled eggs is to pull them off the heat just before they reach the the desired consistency, as they will continue to cook and set even as they sit on your plate. 03. Why does the cake pull away from the sides of the tin? One tell-tale sign that a cake has slipped into the over-cooking stage is when the sides start to pull away from the tin. This indicates that the cake has reached an internal temperature that exceeds 100°C/212°F, and the moisture has been driven out by evaporation from the surface area. 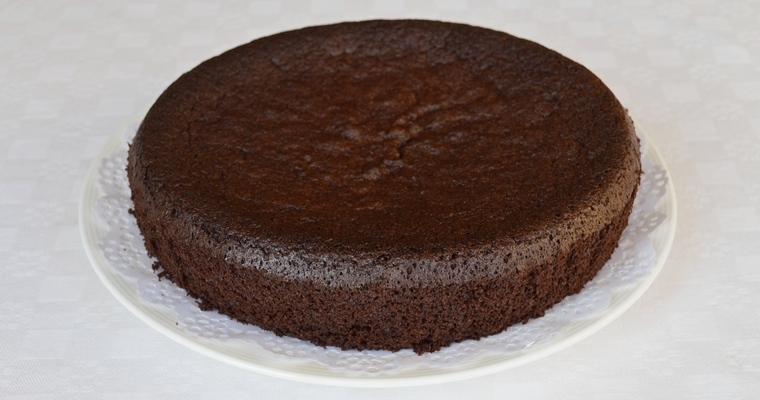 This causes shrinkage by reducing the volume of the cake in the tin – especially in cakes which contain a large proportion of liquid ingredients in the batter, such as this one. Do not overcook – the top should be set, but the centre should still feel a little squishy when lightly pressed. Leave to cool for 30 minutes in the tin – the cake is fragile when warm, and will crumble until the centre has cooled and set. Preheat the oven to 160°C/320°F. Lightly grease the sides of a 23cm/9″ round, deep and loose-bottomed cake tin with olive oil, and line the bottom with baking paper. Sieve the carob powder into a bowl, then add the remaining dry ingredients (ground almonds, baking soda and salt). In a large mixing bowl, measure out the wet ingredients (egg yolks, honey, olive oil and almond milk). Mix the wet ingredients until blended using the same whisk. Add the dry ingredients, and stir until blended using a wooden spoon. The mixture will be fairly loose and runny. Pour the mixture into the prepared tin, and transfer to the preheated oven. Bake for 45 minutes – 1 hour, until the cake starts to pull away from the side of the tin, and a toothpick comes away clean when inserted into the centre – about 45 minutes – 1 hour. The centre will still feel a bit squishy, but not wobbly (the cake will firm up as it cools in the tin). Wait until the cake has cooled for 30 minutes before running a palette knife around the sides and turning out onto a wire cooling rack. Just wondering if almond meal or almond flour can be substituted for ground almonds. I’ve never totally understood the difference. If one can be substituted, is the amount required the same? ‘Almond Meal ‘is the same thing as ‘Ground Almonds’ – that is, whole almonds that have been ground, skin and all, to a fairly course particle size. ‘Almond Flour’ (at least in the UK) is ground to a much finer particle size, and the almonds have been blanched to remove the skins. This involves briefly plunging the almonds into scalding hot water, before running them through rollers to rub off the skin. The nuts have to be completely dried before they can be ground. This process removes some of the natural nut oils, meaning that almond flour is drier than ground almonds. Confusingly, the ‘Almond Flour’ that is sold in the UK is not the same thing as the ‘Blanched Almond Flour’ that is sold n the US. I discovered this to my cost when I tried to make the ‘Strawberry Cake with Lemon Cream Filling’ from the American blog Against All Grain. The product I used was labelled ‘Extra Fine Almond Flour’. The almonds had been de-oiled, which made the flour much drier and thirstier, resulting in an inedible brick! As a result of these differences, ground almonds produce denser, grittier, browner and oilier bakes than almond flour. You can’t really substitute one for the other. There’s a bit more information on this in my article Replacing Flour with Ground Almonds.